In many circumstances, it is possible for failures to occur immediately at the beginning of the life of the product. These failures are sometimes referred to as out-of-the-box or short-term failures and might be attributed to problems in manufacturing, insufficient quality control and pre-shipping inspection, poor packaging or shipping damages. The failure times for such units are zero. Zero values can also be found in a variety of other data set types, such as level crossings in customer usage measurement programs (measurement of a number of events) or time in band (measurement of time spent in a given state). This article examines the effect of the zero values on data analysis and presents a warranty data analysis example containing out-of-the-box failures data using Weibull++ 7. A previous issue of Reliability HotWire introduced the Percent Non-Zero (PNZ) calculation as a method for analyzing data sets with zero-value data points and presented an example of usage data that contained zero values. In this article, we present a more thorough explanation of the analysis method. Let us consider a data set with the following failure times: 0, 0, 0, 65, 65, 92, 120, 124, 141 and 171. Assuming a Weibull distribution, and using rank regression on X (RRX) as the analysis method, the probability plots looks like the one shown next. Where PNZ is the percentage of the population with non-zero failure times (note that zero-value suspensions are ignored in the calculations). In the previous example, 7 out of 10 units failed after time zero and 3 units failed at t = 0. Therefore, PNZ = 0.7. It is because of the multiplication of the R(t) function with PNZ that the probability plot curves. More reliability-related functions are listed in Section 3 of this article. Consider the following data entered in a Nevada format warranty folio. The data set consists of sales from 3 months (September, October and November 2007) and returns from 4 months (September, October, November and December 2007). The returns included units that failed right out-of-the-box. 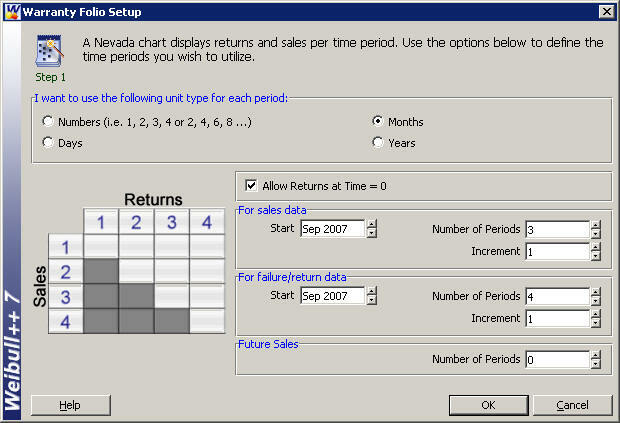 The Nevada chart is set up as shown in the next figure. Notice that the option to allow returns at time zero is checked. 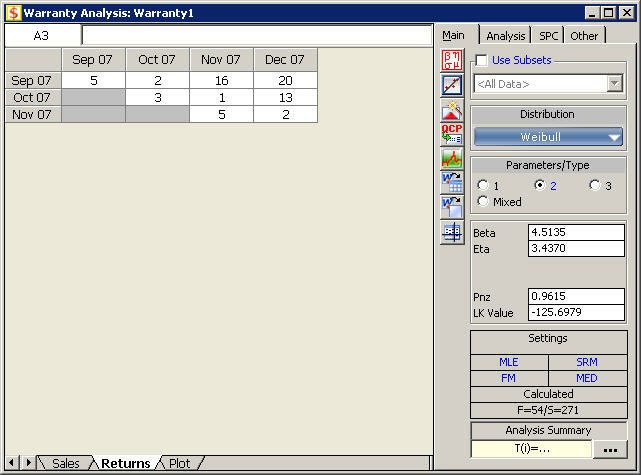 The sales data and returns data are shown in the next figures. The product is assumed to follow a Weibull distribution and the maximum likelihood estimation (MLE) method is chosen for the analysis because of the large number of suspended units. These figures also show the estimated Weibull distribution parameters (β = 4.5135 and η = 3.4370 months) and the PNZ value, PNZ = 0.9615. 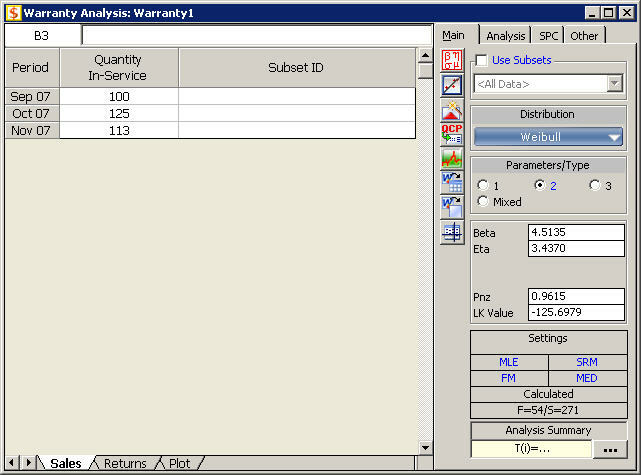 Note: The option to display the PNZ value was chosen on the Data Sheet page of the User Setup. The probability plot is shown in the next figure. The curvature of the plot is due to the non-zero failure times in the data. The curve crosses the y-axis at 1-PNZ, or the percentage of units failed at time equal to zero. 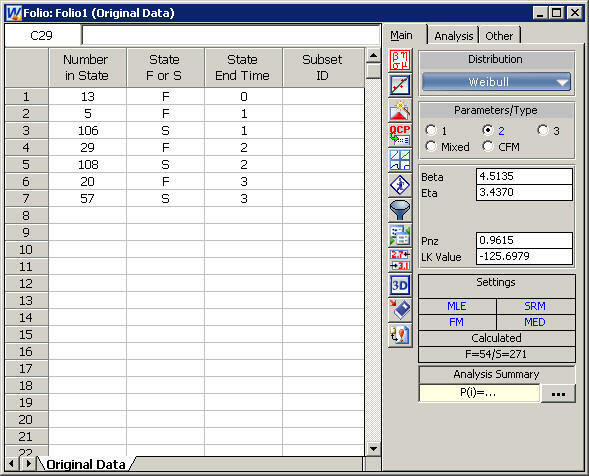 The parameters β and η were calculated using rows 2 through 7, then the reliability function for the entire data set was adjusted using the PNZ value. To compare the effect of the non-zero data on the life data analysis functions, a new folio was created without the non-zero subset, as shown in the next figure. 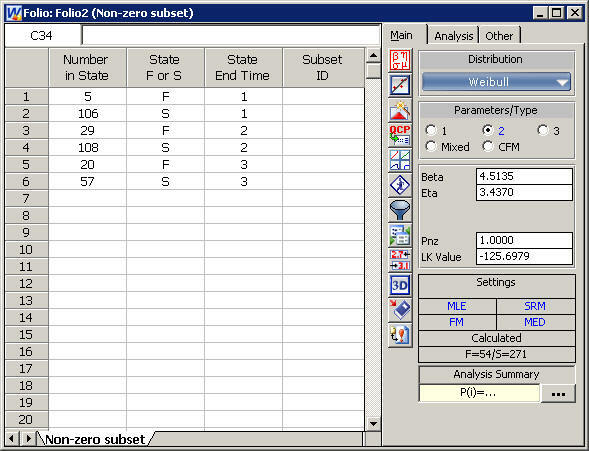 Notice that the β and η for the original data set and the non-zero subset are identical, while the PNZ is 1 in the non-zero subset, indicating that all the failures happened after time equal to zero. The next set of figures shows the probability, reliability, and failure rate functions for the entire data set (in black) and the non-zero subset (in blue). The effect of the PNZ is seen on the probability and reliability plots. Notice that the difference between the curves on these plots is largest for small values of time, and decreases as time increases. The last plot provides verification that the zero-value data points have no effect on failure rate, since the curves are indistinguishable. For the remainder of this article, we will denote functions derived using only the non-zero data points in the data set as g(t), and functions derived using the entire data set as g'(t), where g is any function of a distribution. where Q(0) is 1-PNZ. In other words, the unreliability at time t is the sum of the unreliability of the population at time equal to zero plus the area under the pdf until time equal to t.
This article examined the effect of the PNZ method on common life data analysis functions, including the reliability, unreliability, probability density, conditional reliability and failure rate functions. It can be seen that the reliability, unreliability and probability density functions depend on the value of PNZ, while the conditional reliability and failure rate functions are independent of the number of zero-value data points. These concepts were applied to a warranty analysis example.